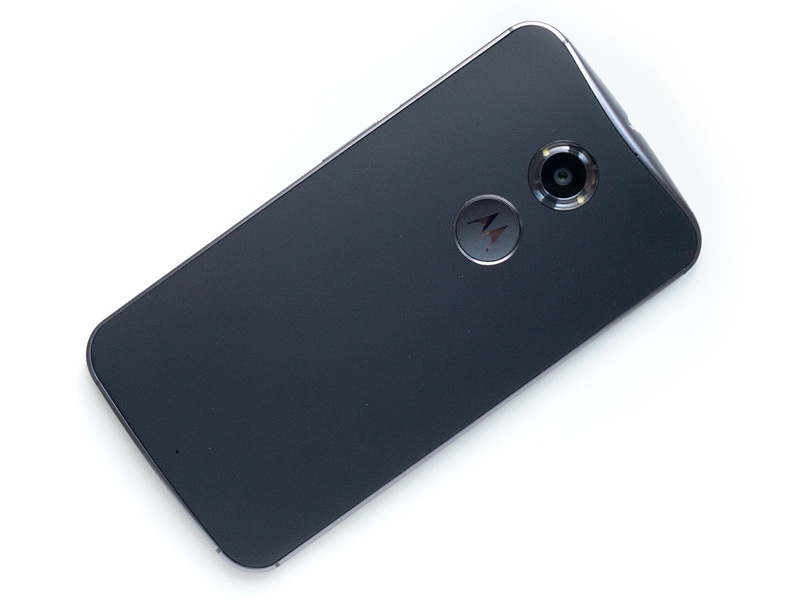 The vibrant 5.2-inch 1080p screen covers almost the entire front of the Moto X. The thin bezels and metal frame give the device a premium look and feel. 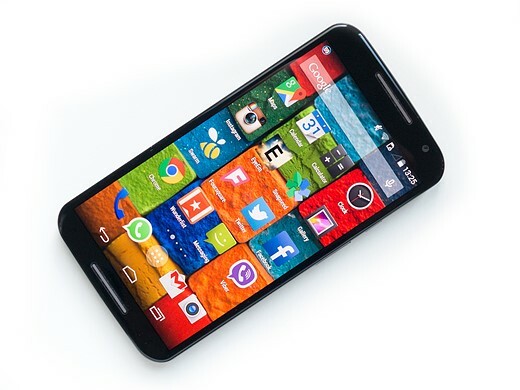 With its 5.2-inch screen the 2014 Moto X is a considerably larger device than its predecessor and even a little bulkier than a Samsung Galaxy S5, but thanks to its very thin bezels it feels smaller than it actually is and still works reasonably well in one-handed operation. The new model uses the same curvy design language as its predecessor but thanks to the thinner edges, a metal frame and overall better build quality it feels more like a premium device. It is a little thicker at the top end, where the camera module and flash are located, but gradually slims down toward the bottom and lateral edges. The rubberized back cover feels pleasant in the hand and offers a good grip. 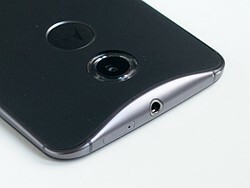 The camera lens on the Moto X's back is surrounded by the dual-LED ring flash. 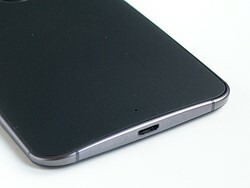 Power button and volume rockers can be found on the right edge of the device. When used as a camera the new Moto X sits well in the hand, even without a case, but there is no harm in using one for protection purposes. The only physical controls are the power button and volume rockers on the right edge. The latter can be configured to act as a camera shutter button but does not offer the two-stage action of a dedicated camera button. 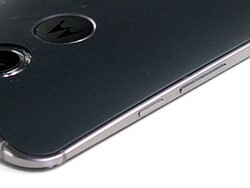 In terms of camera hardware the 2014 Moto X offers a 1/3.06-inch CMOS sensor combined with an F2.25 aperture and a 2MP front unit. The camera is capable of recording 4K and 120 fps slow motion video but like its predecessor there is no optical image stabilization system. At 31mm the equivalent focal length is not quite as wide as some competing models but arguably that makes the Motorola a better option for portraits and close-up photography. With a diffusor ring covering two LEDs the flash unit is quite unusual and matched only on the recently announced Google Nexus 6. 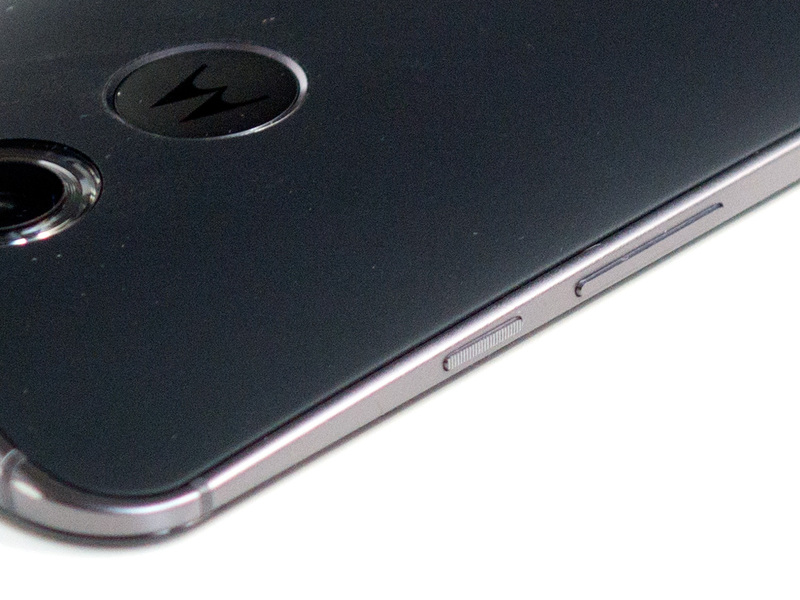 The camera end of the Moto X is a little bulkier than the bottom. As usual there is a microUSB-connector for charging and syncing with a computer. Other specifications lag just a touch behind some other high-end Android devices, such as the LG G3 or Samsung Galaxy S5, but offer more than enough to ensure smooth operation of the Android 4.4 OS at all times. A Qualcomm Snapdragon 801 SoC with quad-core CPU is combined with 2GB of RAM and you can choose from versions with 16 or 32GB of storage. The 5.2-inch AMOLED display offers very vibrant colors, excellent brightness and a 1080p full-HD resolution.